In last week’s post, I promised to walk you through how to create a simple table report in Power BI Paginated Report Builder from a Power BI dataset. Why would someone want to do this, you ask? Well, how many tables in your Power BI Desktop reports look like this? 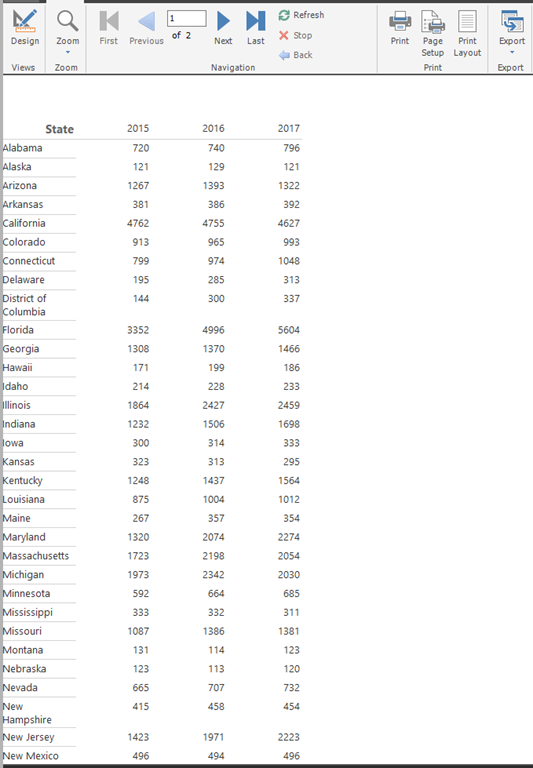 So while you can interact with it in the browser and scroll to see all the rows, when you export it out to PDF, it looks like this. 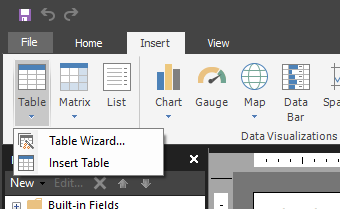 Having tables in Power BI reports auto-expand when exporting is a common ask amongst Power BI users. Unfortunately, the current behavior won’t be changing anytime soon. With paginated reports, however, your tables can auto-expand across several pages upon export, and they’re designed for just this type of use case. Let’s walk through how to build a paginated report for this table against the same Power BI dataset. 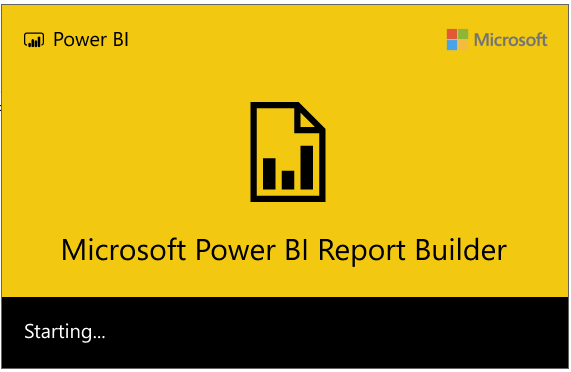 Make sure you’ve downloaded and installed Power BI Report Builder as a first step. Once that’s done, create a new blank report as your project. myorg can be replaced with your tenant name (e.g. “mycompany.com”). [your workspace name] is case sensitive and can include spaces. My connection string looks like the following after pasting it in. Power BI Report Builder will automatically place “Data Source=” in front of the connection string I’ve pasted in to make sure it works properly. Click “OK” to save this data source in your report. 2. 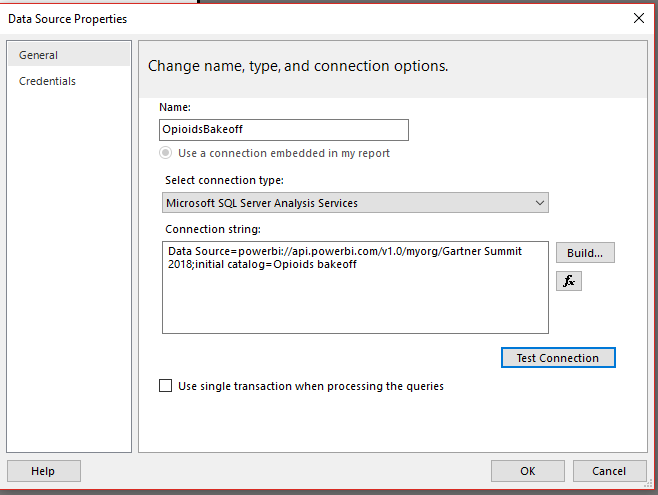 Alternately, you can use a Power BI Desktop file locally as your SQL Server Analysis Services data source to create this report against by using the diagnostics port Microsoft documented in 2018. This may help accelerate development in certain scenarios by allowing you to build this out when you’re traveling on a plane, etc, and also allow you to test performance of the paginated report in more advanced scenarios you want to tackle (I confirmed with Adam Wilson there was no issue with letting folks know about this). 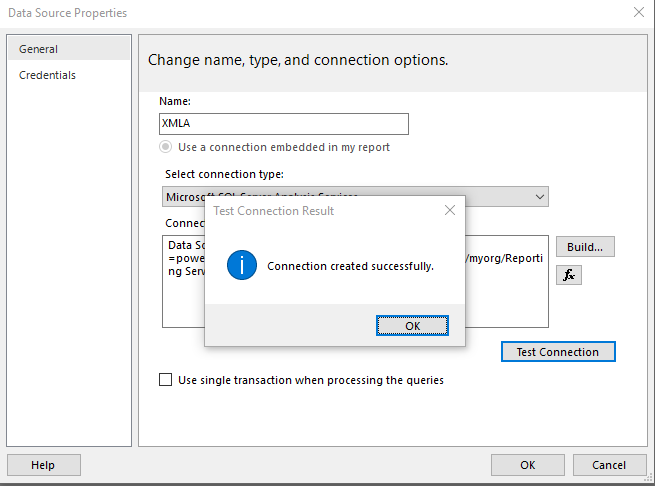 Just make sure you change your connection string for your data source after publishing your Power BI Desktop file and prior to publishing the paginated report to your Power BI workspace using the information I just covered. Now matter which option you’ve chosen, the tutorial I walkthrough proceeds the same way. 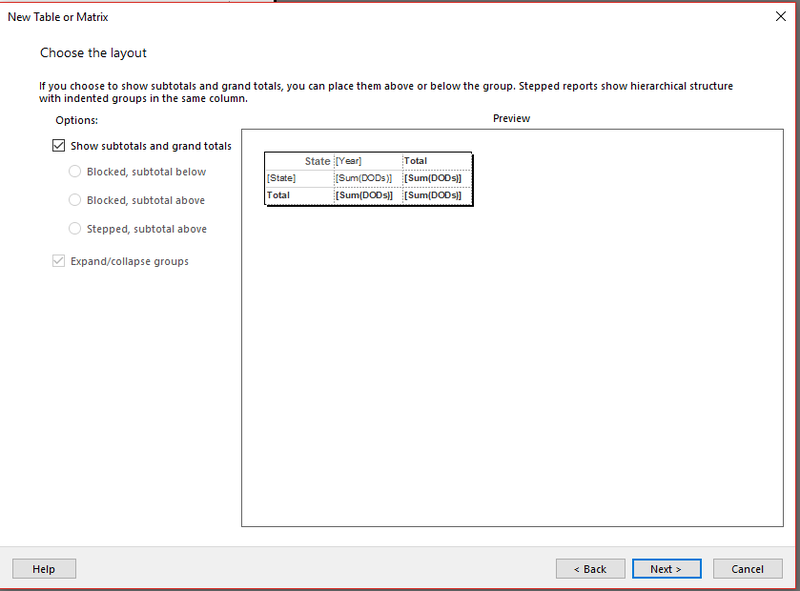 Next, right-click on the “Add Dataset” to add a new dataset to your report. Datasets in paginated reports are a little different than those in Power BI reports you might be used to. A dataset in a paginated report is just a single query that runs against the selected data source and returns data. 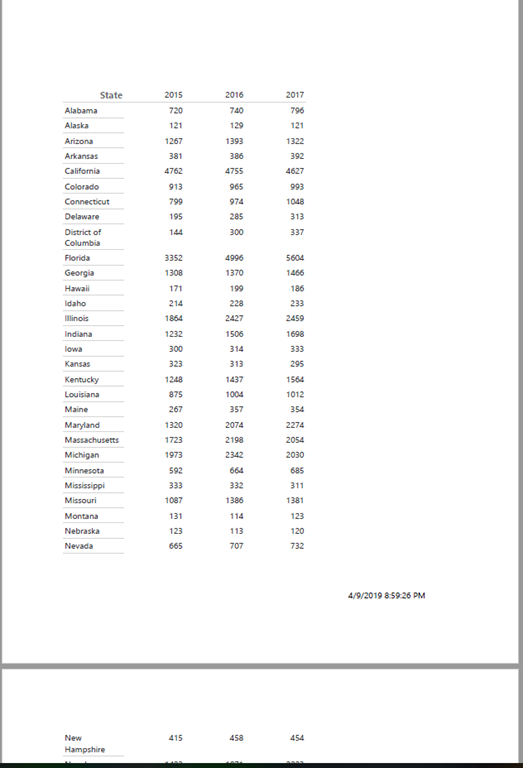 You can have several datasets in your report, but in this example, we just need one. 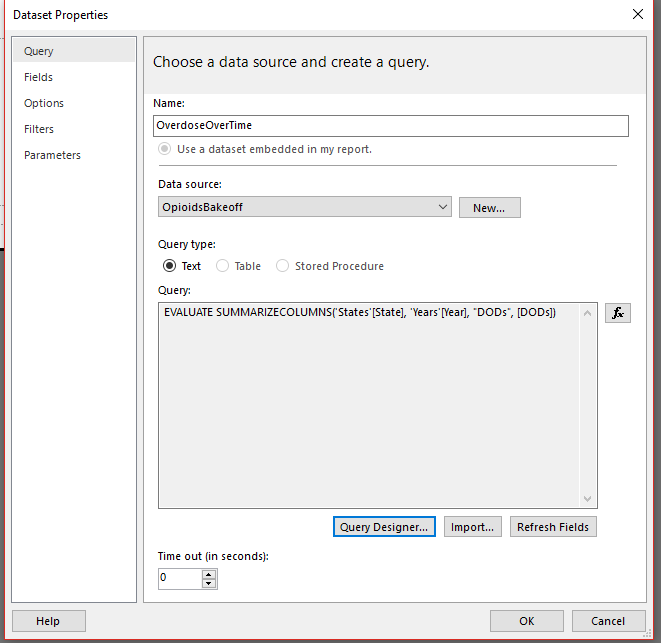 I’ll name my dataset, select the data source I want to run it against, and click the “Query Designer” to create my query I want to run and return data from. As I mentioned on Twitter earlier this week, Paginated Report Builder has a visual designer that will craft the DAX query once I drag and drop the fields in I need. I just need three for this particular query, and get the following result when I execute it. Looks like I have everything, so I click OK and then save my dataset. 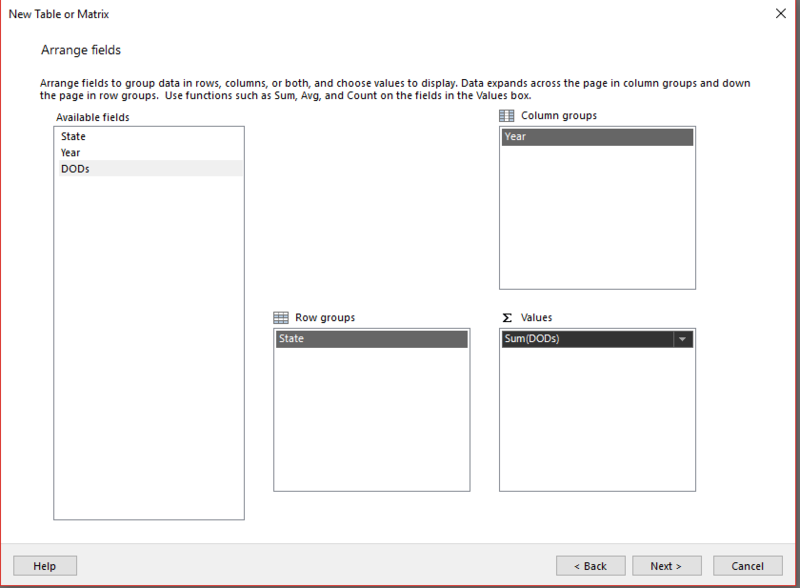 I select the dataset I just created, and drag and drop the fields into the groups accordingly. I want each row have a “State”, and have each “Year” be a column. My values are a simple sum of the “DODs” field. This allows me to have subtotals and grand totals for my groups if I choose to do so. I have what I need, so I click Next. I’ll leave the “Show subtotals and grand totals” checked and complete the table wizard. I’m going to delete the column group on the right of my table that says “Total” at the top by right-clicking on it. With that change, my table looks like the following. 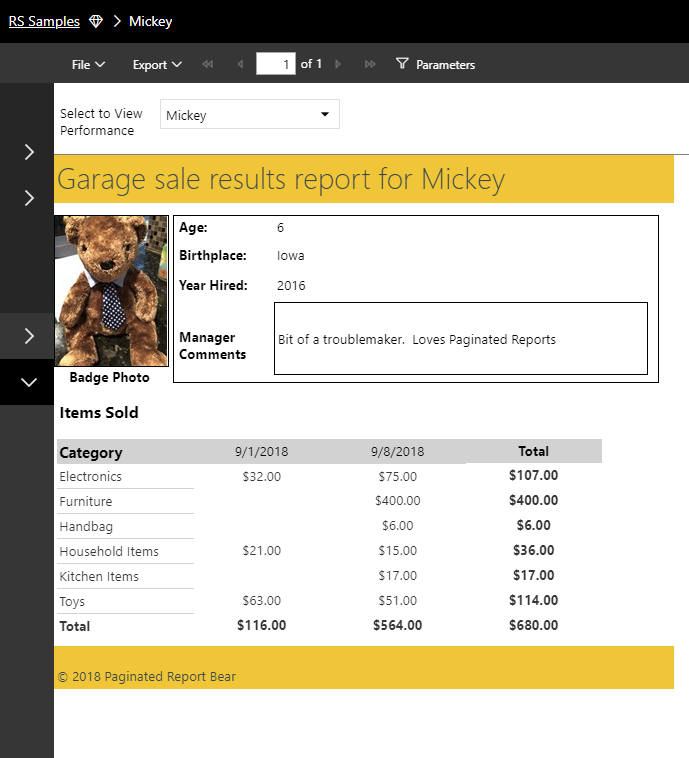 You don’t see data changing live when you’re designing the report like you do with Power BI Desktop. Instead, it’s a similar experience to designing a Mail Merge document in Microsoft Word – you’re creating a layout of how you’d like your report to look, then feed the data from the data source to generate the report/document. To see the report you’ve designed with your actual data, click “Run” from the toolbar under the Home tab. 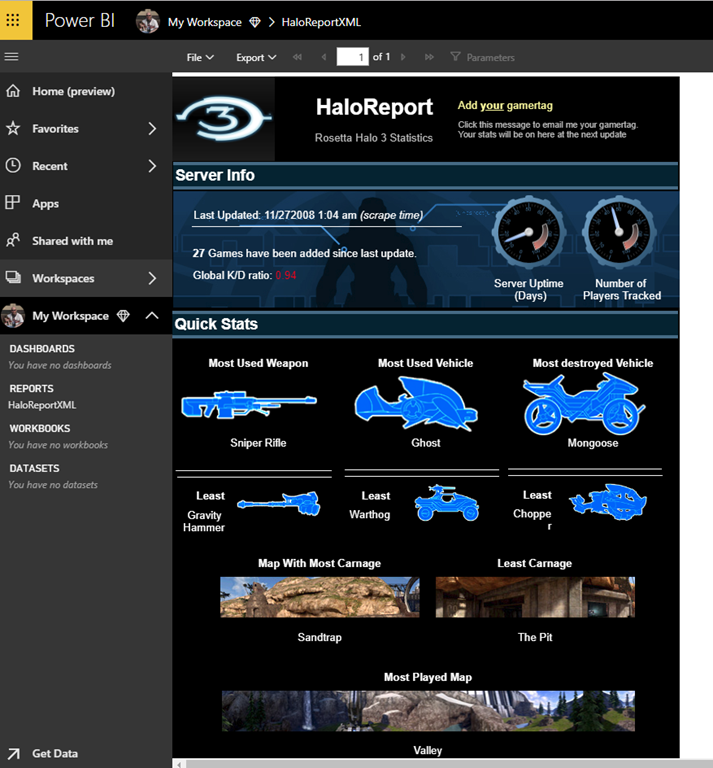 Here’s what my report looks like. I’ll export it to PDF to confirm it will auto-expand across multiple pages, and sure enough it does. If you’ve stayed with me this far through the post, thank you and you’ve finished creating a simple table report against a Power BI dataset. There’s clearly much more I could do to make this look prettier, but it isn’t necessary in this particular scenario for my users (which is, well, me). In a follow-up later this month, I’ll have a short final post around publishing this to the service and linking to it from my Power BI report there. This question has come up more than I can count, so I am doing a super quick blog post to answer it for folks. Many people are well aware of the limitations around exporting data in Power BI today. 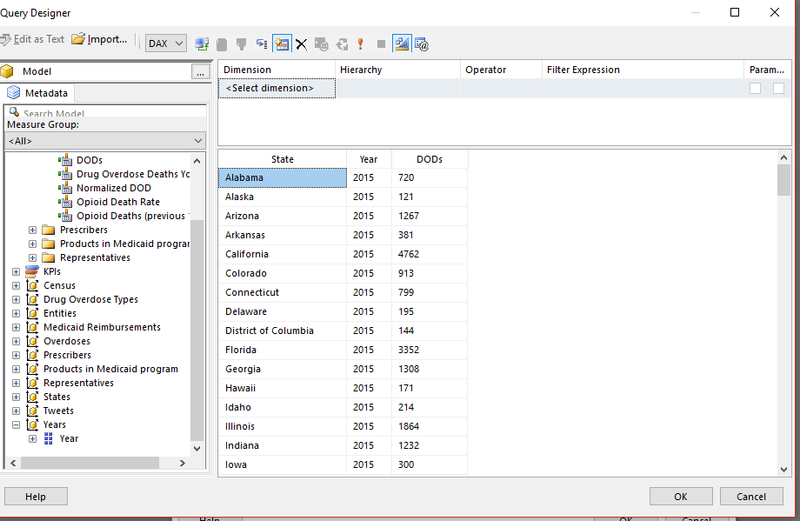 The biggest one I hear about is you can’t export more than 150,000 rows to Excel from a Power BI Report visual. 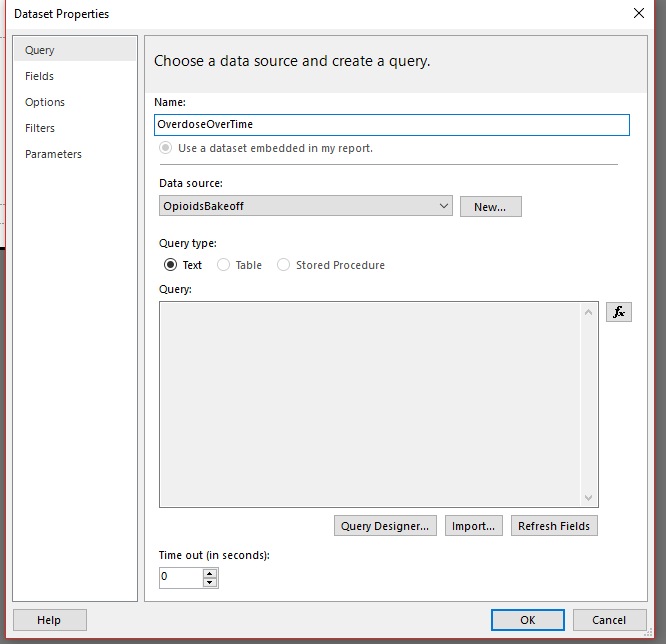 Since people always want to export data, the question came to me immediately when we released the paginated report capabilities in Power BI if we had the same restriction. I know from several customers I’ve worked with in the past that many of their SSRS reports are/were nothing more than a single table with some parameters that users visit to dump out the data they need to an Excel or CSV file, so I wasn’t that surprised it came up. 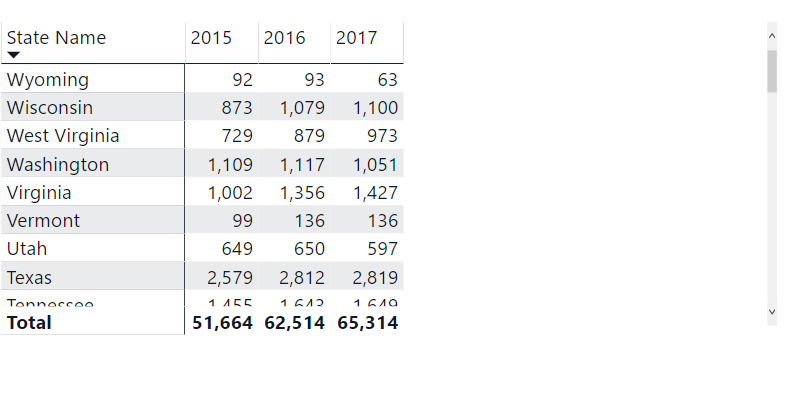 The answer is no, we don’t put any cap on the number of rows you can export from a paginated report in Power BI to Excel, CSV, or any of the formats we support. 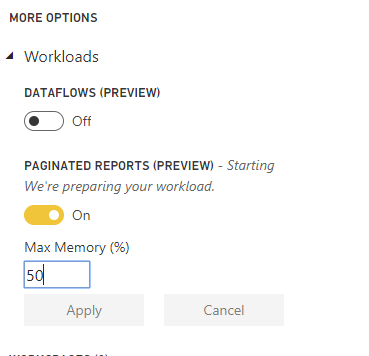 The only limitation is the amount of memory that’s available for Paginated Reports in your Premium capacity. Hence the asterisk in the blog title – eventually you’ll run out of memory if you try to export too much at one time, so if you try to export a table of 1 trillion rows and 40 columns to a CSV file, I’m fairly sure you’re out of luck and will fail. But as you can see by the picture, I exported one of my reports with over 240,000 rows out to a CSV file without a hitch. 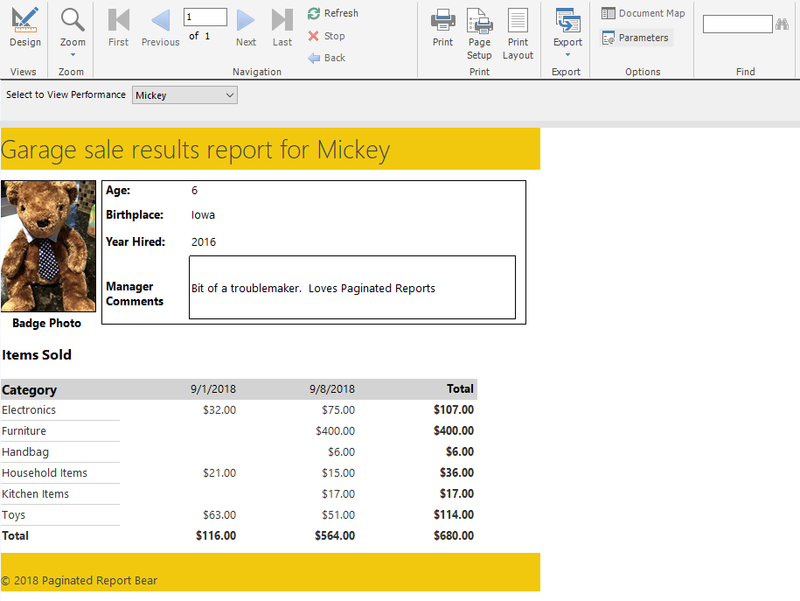 There’s much, much more you can do with Paginated Reports in Power BI (and Patrick LeBlanc has done some awesome videos about a number of those items on the Guy in a Cube YouTube channel), but for those folks who want to use paginated reports to help them with this use case, you absolutely can do so. Hi everyone, it’s guest blogger Paginated Report Bear! Well, actually, Mr. Chris agreed to type for me since I don’t have fingers. Anyways, if you watched my intro video, I promised you all I’d make a sample report and share it by the end of the week. 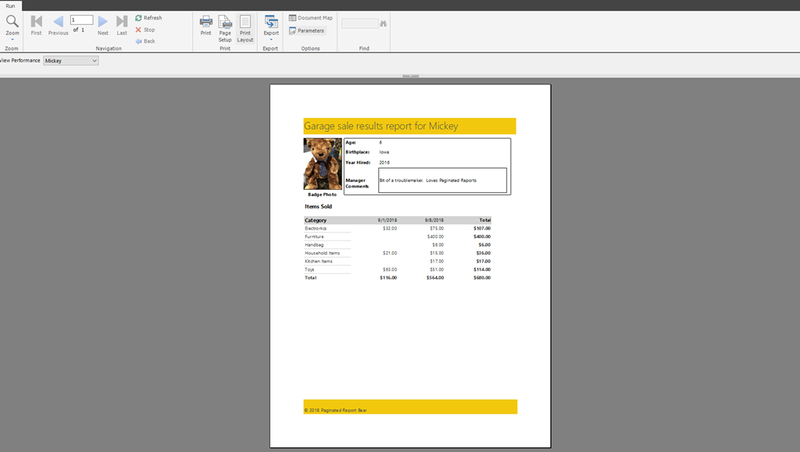 Since I always keep my promises (EDITOR NOTE: no he doesn’t), here is my first paginated report that you’re free to download and try out in Power BI! 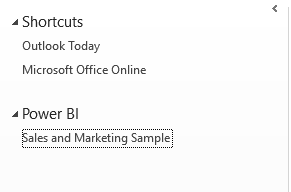 It uses the Enter Data feature that was introduced a few months ago, so you can upload it as is into your Power BI (Premium) workspace and give it a try. If you don’t have Premium capacity, use the steps in Mr. Chris’s last blog post to spin up a capacity and try it out yourself. The report sample has a couple cool tricks in it, like dynamic images based on the parameter you select, so it might be a nice reference for you in the future. I’ll be creating more samples and talking more about paginated reports in the future (or not, depending if my son gets tired of doing this). Since the Eagles game doesn’t start until later, thought I’d put this together for folks. 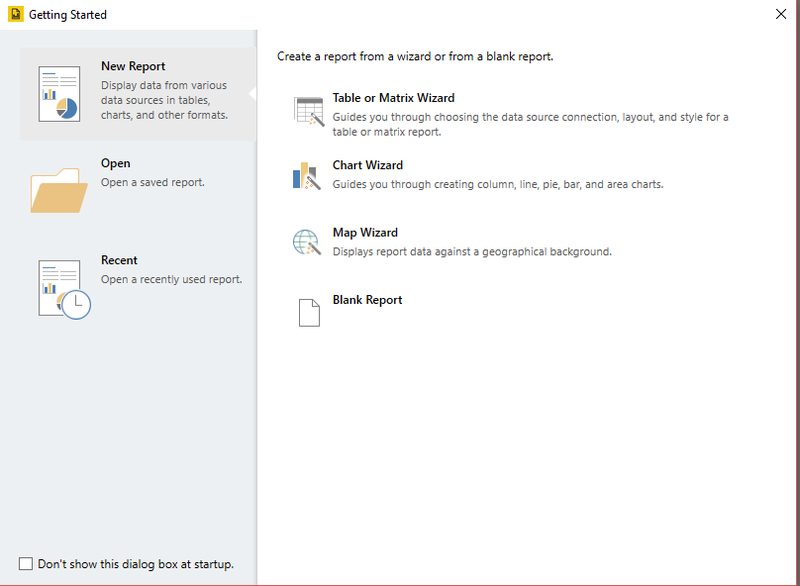 As many of you know, earlier this month we announced a preview of Paginated Reports in Power BI. While folks were excited about this, there were those who were disappointed it was only available (for now) if you had Power BI Premium. The good news is, there is an easy way to do this. See, as I’ve stated in previous interviews, you can try all the functionality out by spinning up an Power BI Embedded A SKU capacity, which is available to purchase through Microsoft Azure. While normally A SKU’s are specifically used for embedding scenarios, there is no licensing restriction against using them internally if you’d like. However, generally this makes little sense vs. purchasing a P SKU for most use cases, since each user would still need a Pro license to access the Power BI portal AND it’s almost $1000 more per month if you run it all the time. 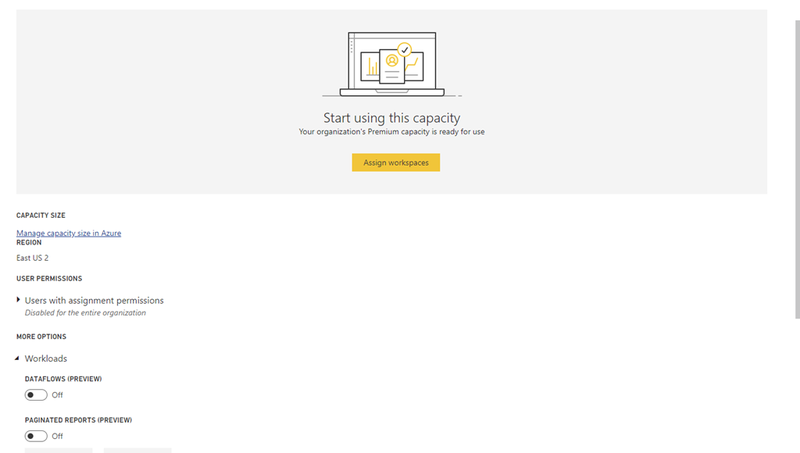 I have my own Power BI subscription (yes, I pay out of pocket for this), since I like to have access to the exact same experience as all of my users do (or I forgot to turn it off when I joined the team . . .). In any event, I have a Pro license, but when I check the Admin Portal, I can see I have no Premium capacities right now. 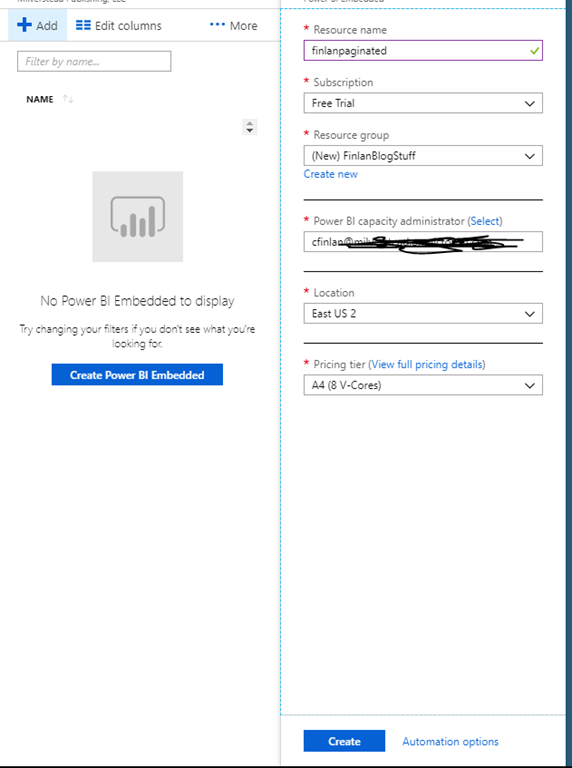 Note another tab there which says “Power BI Embedded” – I don’t have any of those capacities, which you purchase in Azure, spun up currently either. 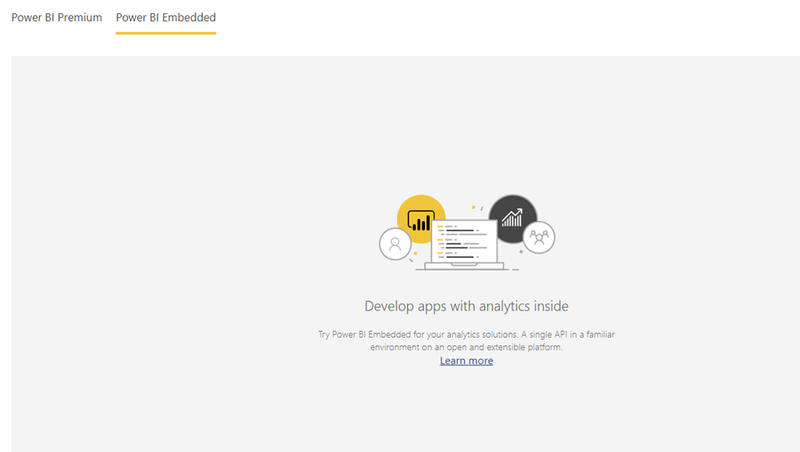 I hit the “Create Power BI Embedded” button, which, if you haven’t signed up for an Azure account yet, you’ll be prompted to do so, and this includes a $200 credit for 30 days. 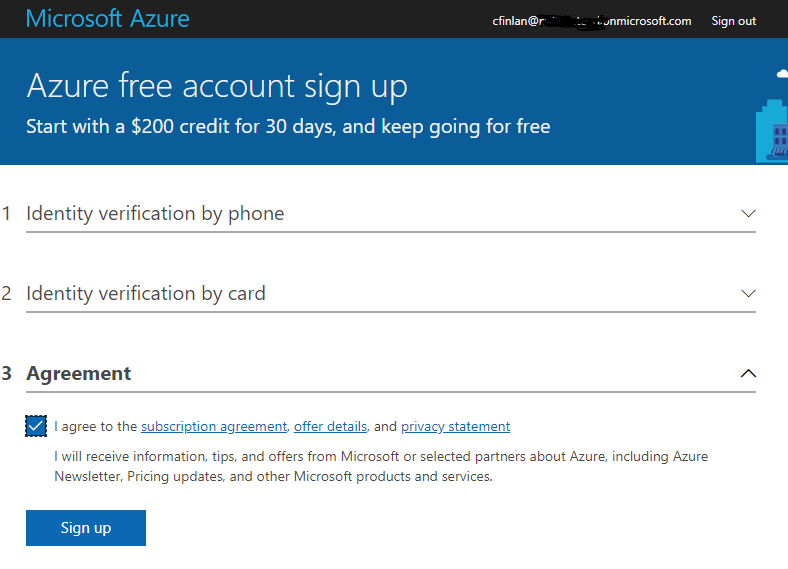 If you have signed up for Azure, you will skip this step (duh). Everything looks good, so I’ll hit create and wait for it to finish deploying. 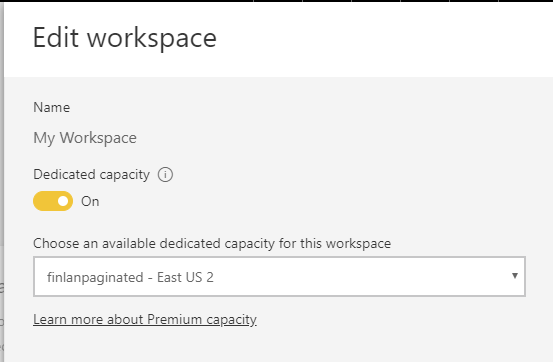 Once it’s completed deployment, when I click on the capacity name, I’ll see I can manage this capacity just like I would any premium capacity in Power BI. Under the Workloads, I see the two new preview workloads, and I’ll set Paginated Reports to “On” and assign 50% of the memory to that workload. I can also try out the new Dataflows workload as well, but I’ll save that for another time. After a few moments, I’ll see the message has changed from starting to Ready, and my workload is now ready to use. I’ll assign all (one) of the workspaces for my organization to this new capacity. Cool! Now, I can upload my first paginated report to the workspace and view it. I’m using a vintage Halo sample report, and it renders without a hitch. But now I want to stop using the capacity and not get charged (since I finished this blog post). No problem – I can go back to the Azure portal and just pause the capacity until I want to use it again. 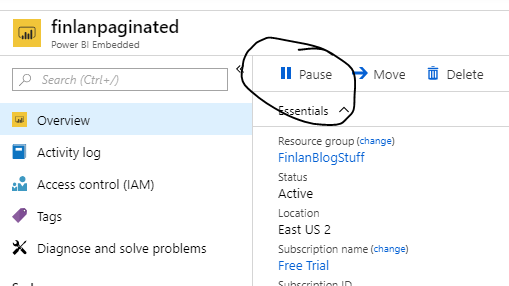 When I’ve paused it, I can no longer view my paginated reports in Power BI, but they aren’t deleted or otherwise affected. They’re still there waiting to be used again when the capacity is started up, and I can delete them if I need to. And that’s it – in less than an hour, including the time it took to type this blogpost, I created a new Azure subscription, created my first Power BI “Embedded” A4 capacity, turned on the Paginated Report workload, assigned a workspace, uploaded and viewed my report, and then paused the capacity to stop the billing on it. Whew! Thanks so much for reading through the post today, and I hope you all take some time to try out the new paginated reports in Power BI Premium. 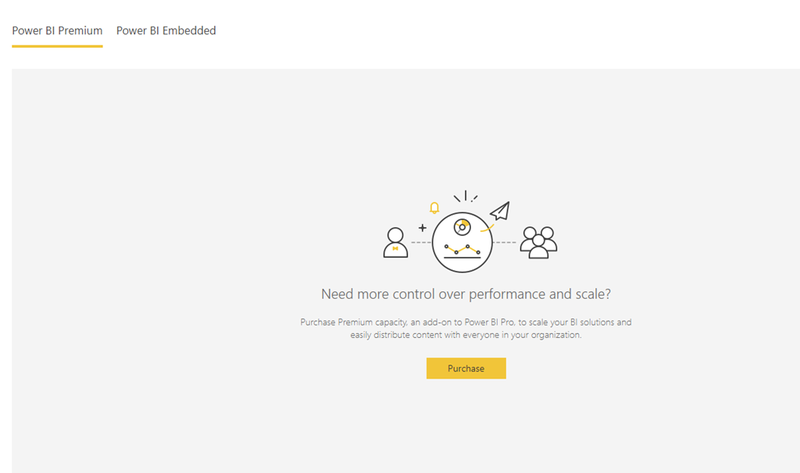 And if your organization doesn’t already have Power BI Premium, use this walkthrough to give it a try yourself! I haven’t written in awhile, but wanted to get this up while it was still fresh in my mind (and had some time left at lunch). 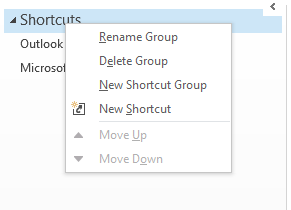 To start adding web pages as shortcuts, I want to have them organized, so I’m going to right-click on the “Shortcuts” top menu option and create a new shortcut group called “Power BI”. I have to be honest – I’m surprised this works as well as it does, and it’s much better than almost any other web page you might pull in there in my limited testing. 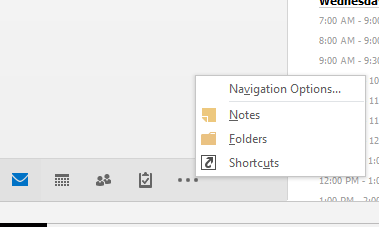 And maybe this isn’t that helpful to some folks, but I worked with a lot of former execs who would’ve LOVED to have been to simply to do everything right in Outlook.